Your Big Wild Imagination is a place where ideas and creativity are unbound. It’s a community of children and adults who come together to create with freedom, expression, confidence – and mess! We are the creators that you come to, to scaffold and facilitate creative experiences that bring people together, excite them, engage them and inspire them. We are educators that empower and encourage children to generate ideas, providing them with experiences that spark imagination and curiosity, that challenge their abilities and mindsets in an environment that builds connections, confidence and community. We cultivate creativity. We don’t believe art is an inherited gene or a specific talent. We need art to challenge people, to push them outside their comfort zone, to be brave, to think creatively, to be ok with the journey not the final piece. Life is busy. Children don’t get a lot of time to imagine and create without expectation. That’s why our workshops focus on the process of creation, not the outcome. 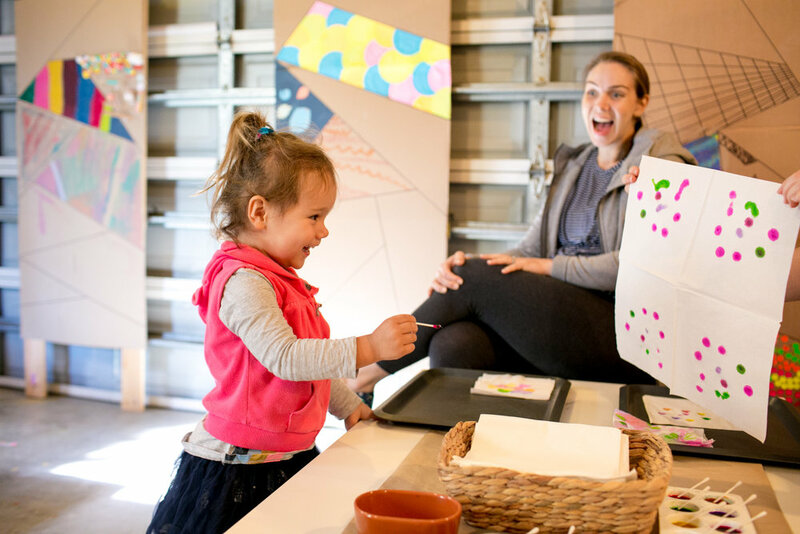 Art play is about being immersed in creativity without restrictions. Given the space and time to explore sensory experiences, children develop a huge range of skills - from critical thinking to collaboration, independent, problem solving, confidence, expression and beyond. We are passionate about creating environments and experiences that stimulate interest and fascination in children. Seeing children discover textures, form ideas and experiment with colour, motion and technique is our delight. As you can tell, we’re not an art school – we’re SO much more! Connection - bringing together a community of people who value and understand the importance of making art. Generosity - shared experiences. Shared knowledge. Kindness to oneself and others. Trust - in the process, in your abilities, in others. Empowerment - to create without judgement. To explore, to play. To be curious. Surprise yourself. Succeed. We’re Ngaire and Steph, friends and early childhood teachers who met while working at an early childhood centre. We recognised in each other a shared passion for the limitless benefits of art play. Knowing there is often not enough time, space or resources to provide creative play for children at home, we started Big Wild Imagination. Steph has a Diploma in Early Childhood Education and an Advanced Diploma in Interior Decoration. She holds a Working With Children Check and Senior First Aid Certificate, including Asthma and Anaphylaxis training. Ngaire has a Bachelor in Early Childhood Education and is an accredited teacher through the NSW Education Standards Authority (NESA). She holds a Working With Children Check and Senior First Aid Certificate, including Asthma and Anaphylaxis training.